We may be best friends, but people and dogs don’t always speak the same language. However, you can become fluent in all things dog by joining Patricia in a full-day seminar on how dogs communicate with their best friends, whether human or canine. You’ll develop an understanding of what it’s like to “see” the world with your nose, learn how to talk to your dog so that he truly understands you, and become an expert at reading visual signals. 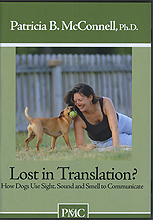 Chock full of research with practical applications to training and communication, this seminar will teach you to “speak” dog like a native.